Four Garden Spot High School students competed at this year’s State TSA (Technology Student Association) Competition that was held at Seven Springs Resort in Champion, PA from April 18-21 this year. There were over 1000 students from across the state at this year’s competition. Lizz Wagner performed well by winning a second place trophy in the PA Material Process competition for her 12’6” long skin-on-frame kayak that she built in her second level woodworking class at Garden Spot that was taught by Mark Kaufman. 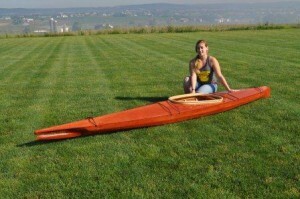 The kayak is a semi-replica of an original Aleutian-style kayak or baidarka that is based on the MAE AC from 1845. 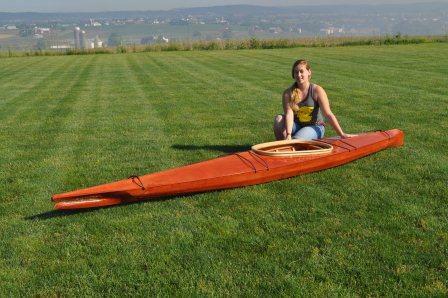 The overall size of the original kayak was 18”4” long x 17” wide. The one that she built was 12’6” long x 22” wide. 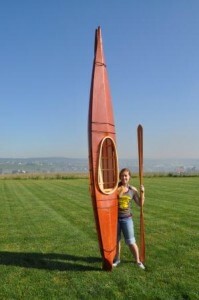 She had to change the overall size of the kayak so that it would not take up more than sixteen square feet of floor space when it was on display at the competition. In order to do this a special stand was made to hold the kayak in a vertical position rather than displaying it horizontally. The length was limited to 13’ since this is how high the ceiling was in the display area. The finished kayak, constructed from Western red cedar with steam-bent white-ash ribs and a stitched-on-nylon skin weighs 24.5 pounds. She also built a replica of the original Aleutian-style paddle from the museum drawings. Her project also included a very detailed photo and written journal of the entire build process. Other Garden Spot high school students that competed at this year’s competition were Haley Reccek, Riley Kohl, and Chris Hare. There were also twelve students from Garden Spot Middle School that competed and received numerous awards. Their advisor was Rob Cuthie and Mike Stitzer was the advisor for the high school students.